The Louie B. Nunn Center for Oral History won the Grand Award from CASE-Kentucky (Council for the Advancement and Support of Education) in the audiovisual category. The award was for the WUKY radio collaboration between Nunn Center director Doug Boyd and WUKY news director Alan Lytle which regularly features oral histories on a variety of topics. The award winning programs can be heard at WUKY, or from the Nunn Center website. In the midst of finals, office parties, and holiday shopping, here's a visit from the ghost of holidays past. 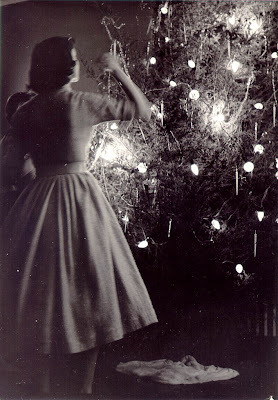 As my time as a student nears its end, I can't think of a better "last post" than to wish everyone Happy Holidays and a Happy New Year! 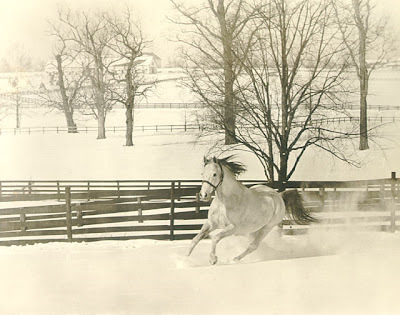 Snow is not exactly rare in central Kentucky, but it is rare to have enough snow for sledding or a good snowball fight. Snowmen tend to be muddy and full of dry leaves around here. 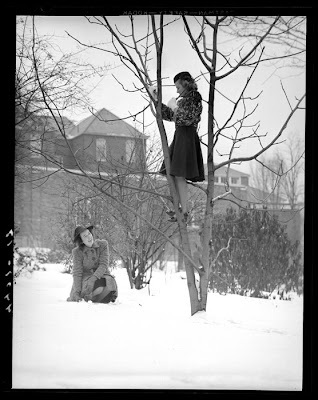 When we do get a good snowfall, it is often accompanied by a sense of playfulness, some images of which have been passed down through the years. 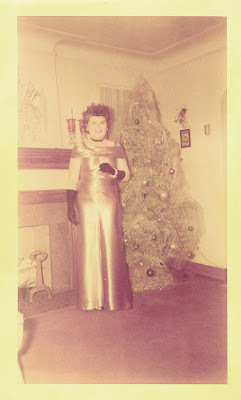 The worst period of her life were those months when her mother thought the pinnacle of humor was to dress her like a lampshade and drag her to the tintypist. This year, share in a new tradition -- the National Day of Listening. You may have heard the interviews aired on the StoryCorps segment of NPR, which brings listeners the life stories of people being interviewed by family or friends. Friday, November 28 has been declared the National Day of Listening, so take along a recorder when you visit with friends and family this week and record a conversation for posterity. 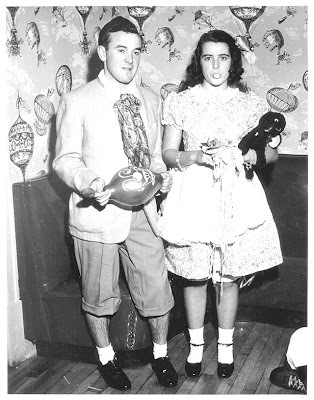 You can also listen to some of the great stories presented by the Louie B. Nunn Center for Oral History by visiting the oral history collections at the Kentuckiana Digital Libraries website. The University of Kentucky's Louie B. Nunn Center for Oral History has begun providing online access to interviews with beloved UK basketball manager Bill Keightley, also known to many basketball fans as “Mr. Wildcat. We are excited to get these interviews online as the UK men’s basketball season begins, giving the public a unique opportunity to not only hear Keightley's interviews but to search transcripts of the interviews for specific memories that most interest the fan or the online user. The Keightley project contains 20 interviews, conducted between 2005 and 2007, includes conversations about Keightley’s life experiences; experiences working with coaches and players, including recordings about coaches Adolph Rupp, Joe B. Hall, Eddie Sutton, Rick Pitino, Orlando "Tubby" Smith and Billy Gillispie; UK Athletics; changes in college athletics, equipment and style of play; and growing up in his hometown of Lawrenceburg, Ky. We will be adding more interviews as the season progresses. Over the past few months, the Nunn Center has worked with the Kentuckiana Digital Library, to design an original interface to more intuitively present oral histories online. Our goal was to construct a better interface that enables users to search by keyword and then link to that specific moment in the audio interview. Users will be able to search through hours of interviews and find exactly the topic they wish to hear Bill Keightley discuss, and then click on that moment in the audio to hear him tell his story. I am hoping that this new interface will serve as a model for how to present oral histories online. Actor, playwright, author, radio commentator, columnist ... "Father of Oral History." Louis "Studs" Terkel is best remembered for exposing the gritty realities of war, race, poverty, and broken dreams through his interviews with everyday Americans. His uncanny ability to connect with people and get them to open up is as legendary as his unmistakable voice, but this talent was revealed to the listening public by accident while hosting a radio music program on WFMT (Chicago) in the 1950s. 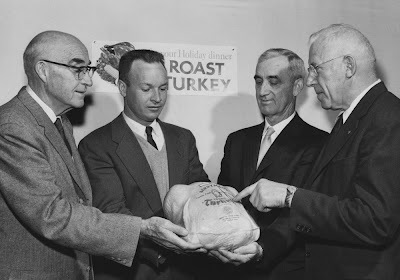 This led to the successful "Studs Terkel Program" which ran from 1952-1997. In 1974, Studs Terkel published the descriptively titled Working: People talk about what they do all day and how they feel about what they do, which was turned into a Broadway musical in 1978. 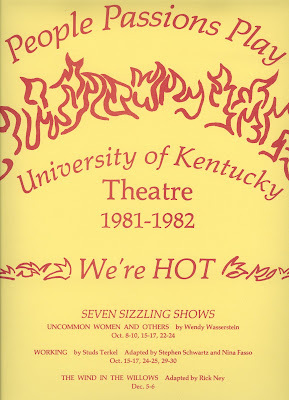 In October of 1981, the University of Kentucky Theatre presented Working as part of a seven-show series focusing on "people passions." Studs Terkel continued writing and interviewing up until the end, publishing P.S. : Further Thoughts from a Lifetime of Listening in 2008. He died October 31, 2008 in Chicago at the age of 96. To read more about Terkel's life and listen to interviews and excerpts from his long-running radio program, see the Chicago Historical Society's "Studs Terkel: Conversations with America" site. 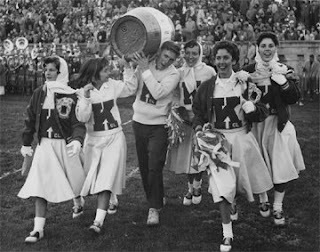 Early students at UK were a rowdy bunch. 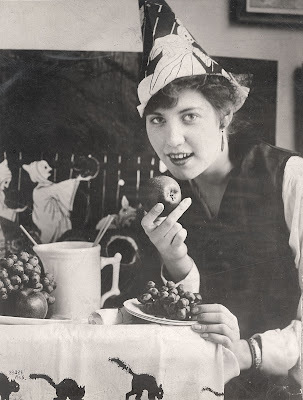 "Town and Gown" relations often suffered in the wake of practical jokes or pranks which got a little out of hand. 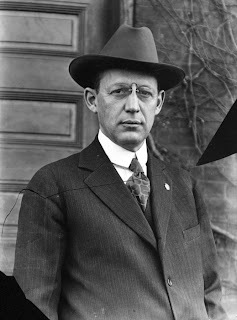 In the Board of Trustees minutes from December 11, 1906, President James K. Patterson recalls his surprise on November 1st to learn that "some of the students had endeavored to obstruct the street car service and had thus come into collision with the police, that a riotous demonstration had occurred on the grounds of Patterson Hall ... Six or eight of those participating in the riotous proceedings were arrested ... Their trial was postponed for ten days pending the recovery of a policeman said to have been seriously injured by stones thrown by the rioters." 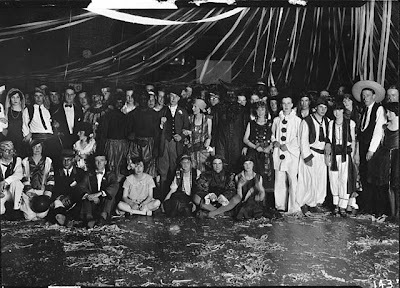 However, it was not until the late 1920s that the school instituted a Halloween Dance in an effort to curb the annual displays of violence and destruction. The fall meet (October 3-25) at Keeneland kicked off Friday, marking 72 years of thoroughbred horse racing at the track. 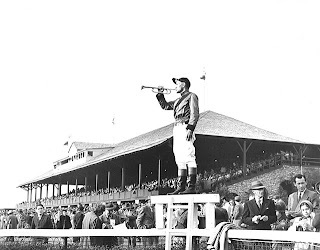 Keeneland was founded in 1935 and began spring and fall racing meets in 1936. Set in the middle of horse farms and rolling bluegrass hills, Keeneland remains a popular spot for locals and tourists alike. Keeneland clings to tradition with the call for the races, paddock walks, tailgating, and the ivy covered clubhouse, but has conceded to some changes in recent years including hiring an announcer for races, and installing a new all-weather Polytrack surface to reduce injuries to horses. Help celebrate Archives Month in Kentucky! This year to celebrate Archives Month 2008, the University of Kentucky's Archives has several virtual exh ibits on display at the Hub http://www.uky.edu/Libraries/lib.php?lib_id=17 in Young Library. 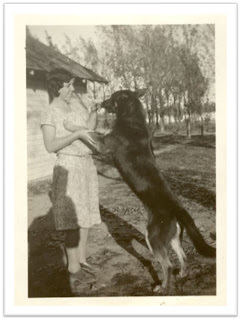 This year's exhibits include, "Dogs of the Twentieth Century" and "Inside Views." There are even more exhibits on display - please visit them if you are in Lexington. 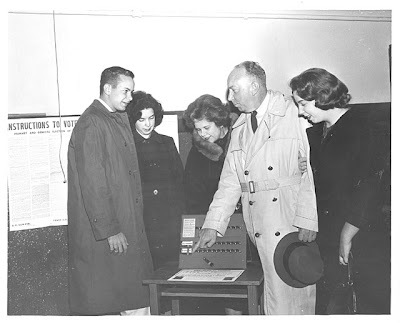 Other events happening around the state can be viewed at the Kentucky Archives Month web site http://archivesmonth.ky.gov/calendar.htm. Kentucky golf fans had plenty of reasons to celebrate the American Ryder Cup win over Europe Sunday – not only was the event held in Louisville on the Valhalla Course, but Kentuckians Kenny Perry and J.B. Holmes were on hand to contribute to the win. 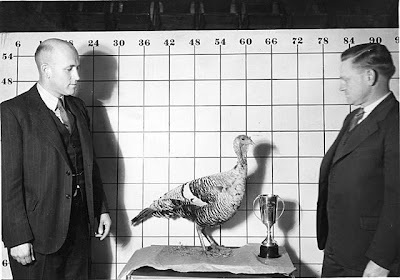 Golf may not be the first thing that comes to mind about Kentucky, but the state does have a long history of enjoying the sport. As immigrants from Ireland, England and Scotland made Kentucky their home, they brought their love of the Scottish game with them. 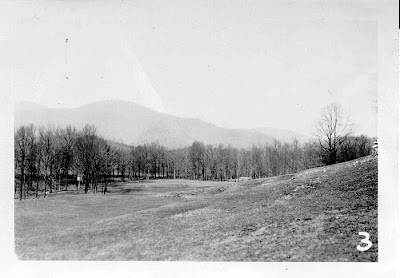 Middlesboro Country Club (below) is the oldest continuously played course in the U.S. and the second oldest course in the nation. 200 year old oaks and the Cumberland Gap serve as a natural backdrop. 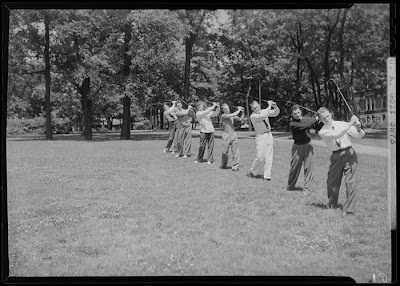 During the 1930s and 1940s, the FDR-created WPA (Works Progress Administration) created golf courses all over the state including McCracken County, Jefferson County, Harlan County, Pike County and Kenton County. 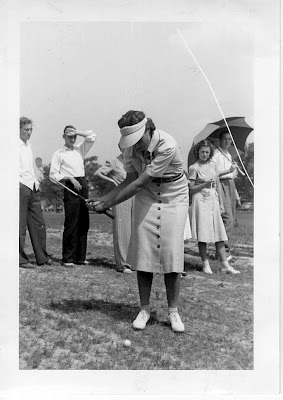 Many of these are documented in the Goodman Paxton photograph collection (see Noble Park Golf Course dedication in McCracken Co., 1940, below). To see more photographs of golf in Kentucky, search “golf” in the images database of KDL. With less than two months left before the presidential election, both candidates are hitting the campaign trail with renewed intensity. At present, there don’t appear to be any further stops from either candidate in Kentucky. 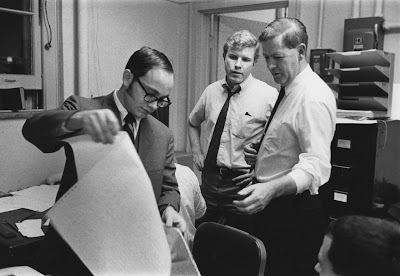 This may not seem unusual in the age of mass media which allows candidates to focus on target areas of the country and still get their message across to the rest of us, but in the past candidates did sometimes make stops at the University of Kentucky or Lexington. 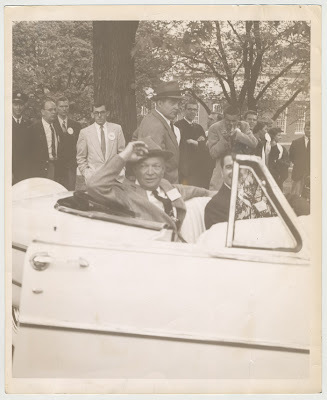 Dwight D. Eisenhower campaigned at UK twice, in 1953 and 1956. On October 1, 1956, Eisenhower addressed issues of concern to Kentuckians at Memorial Coliseum during his re-election bid. Click here to read what he had to say. 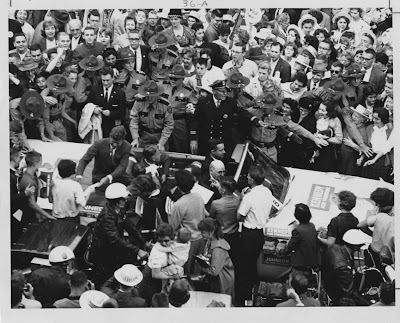 This photo from October 8, 1960 of John F. Kennedy’s campaign stop at UK captures a scene eerily reminiscent of the later footage from Dallas minutes before his assassination. 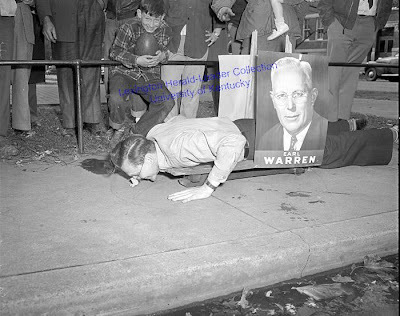 Kennedy was on campus to generate support for his presidential bid that year (and pay homage to Kentucky politician Henry Clay). Click here to read his speech from that day. 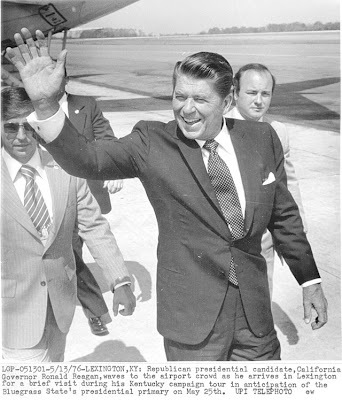 Then (California) governor, Ronald Reagan, made a brief stop in Lexington during his unsuccessful 1976 bid for the Republican nomination against Gerald Ford. The contents of his campaign literature from that year can be found here. 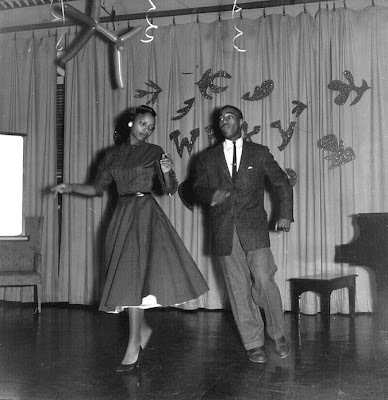 All photos from University of Kentucky Special Collections and Digital Programs. 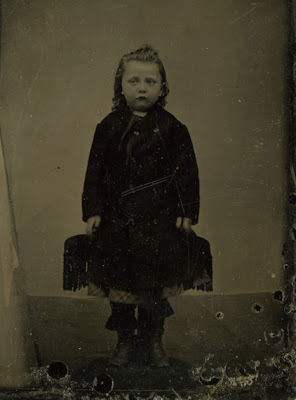 Imagine for a moment that it is the 1880s. 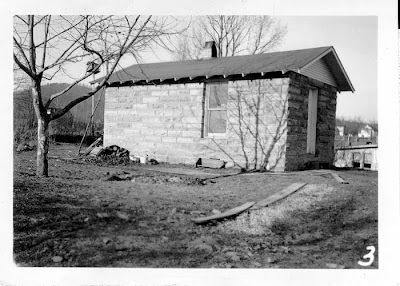 The original President’s home stood near the east end of White Hall classroom building. 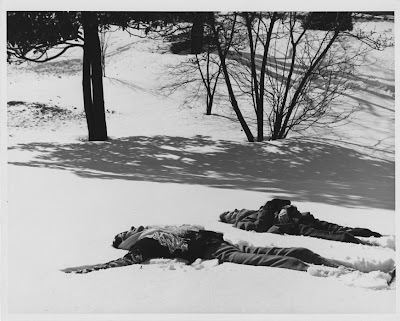 There were only three campus structures, 318 students, and 17 faculty. 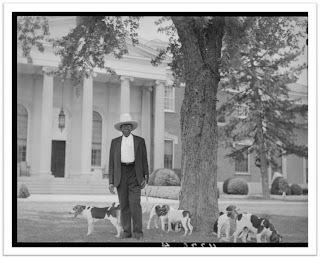 To supplement President Patterson’s $2000.00 salary he was allotted pasturage for his cows. In between the slope of the President’s house and what was then Winslow Street was the land where Patterson kept those cows. By 1892, students began scheduling football games with neighboring colleges. In 1893, Kentucky beat Tennessee 56-0, beginning a long-standing rivalry. 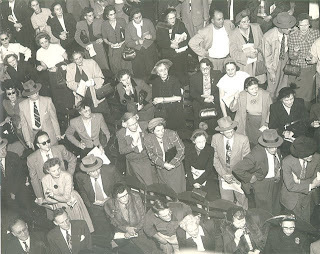 The lure of football soon overtook Lexington and a spectator sport had begun. So it was on this spot, where the cows were eventually evicted, where wooden stands were erected, and the first football fans cheered. From 1908-1915 every football season was a winning one. 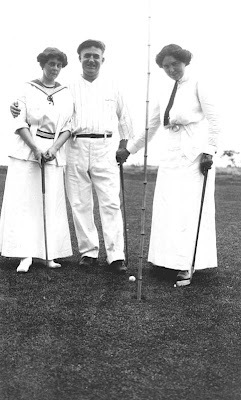 In 1916, Stoll Field was officially dedicated in honor of Richard C. Stoll. 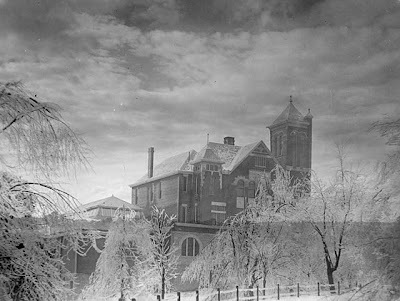 By 1918, World War One had changed campus culture and the University acted quickly to become a combined military post and academic institution. 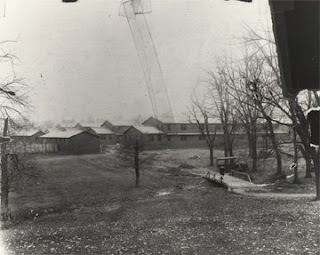 Stoll Field took on a new persona during this time and held army barracks for the soldiers. 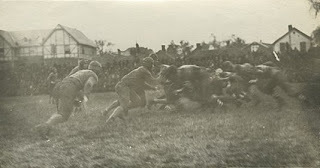 During the 1924 football season, McLean Stadium was built around Stoll Field. Though modified, the stadium was used for football games through the 1972 season after which they were moved to Commonwealth Stadium. There are many places on campus where our history is apparent, but this spot inspires images in my mind and the sounds once associated with this place. As university archivist, it is my obligation to preserve the collective memory of UK. With that said, for this moment, imagine a house-lined street bordered by a field of cows, the early cheers of football fans, soldiers’ yells, the resonance of a stadium crowd, and the contemporary sounds of the marching band. Lasting longer than these words, I hope that this marker will serve as a reminder and symbol of this important piece of campus landscape and culture.